Known as the ‘Mother of All Filipino Festivals‘ in the Southeast Asian country, the Ati-Atihan Festival is another grand and joyful celebration that adventure-seeking locals and foreigners shouldn’t dare miss. Held every January in Kalibo, Aklan, it’s a jam-packed, week-long festival driven by powerful drum beats (and street performances), enthusiastic crowds, and high-spirited ambience – to honour the Santo Niño (Child Jesus). 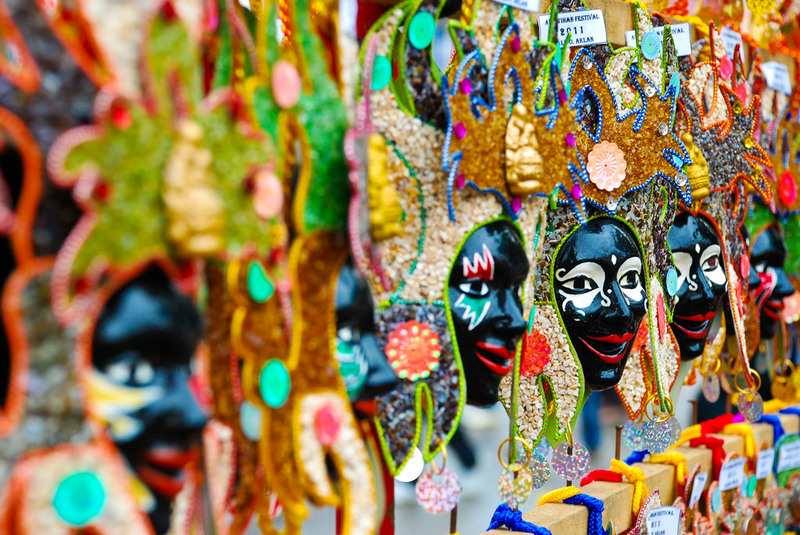 Here we list the top things to see and do during Kalibo’s exciting Ati-Atihan Festival. 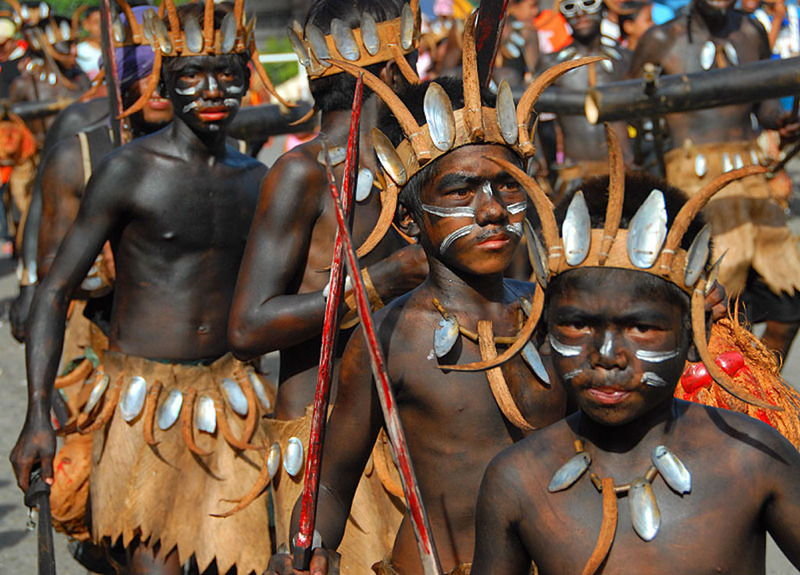 See the town’s version of Mardi Gras in its historical and religious thanksgiving parade to glorify the Santo Niño and commemorate the indigenous people ‘Ati’, known as the Aeta or Negritos, as celebrants cover their faces and bodies with black soot. Witness a variety of floats, thousands of revellers and merrymakers, and Ati-Atihan tribes and groups flood the streets to kick-off the Ati-Atihan spirit. They say the best way to enjoy the Ati-Atihan Festival is to free your spirit, let go of your inhibitions, and just dance to the beat and shout ‘hala bira purya pasma’ (an Aklanon phrase which means pour or dispense all means) or Viva kay Señor Santo Niño! (Long live Child Jesus!) This festival will definitely be one for the books. Be ready to experience extremely loud drum beats and orchestrated foot stomps and cheers, and witness energetic participants covered in body paints and wearing colourful, intricate costumes that will get you into the groove. Expect that people will be everywhere and streets will always be crowded until dawn. That’s because stages are placed around the town as local and famous Filipino bands perform their best hits and continue to liven up the festival. Teachers and students from various school districts in Aklan flood the major streets of Kalibo for the Sinaot sa Calle (street dancing) featuring the higantes (paper-maché giants). Last year, giant paper-maché counterparts of Philippine President Rodrigo Duterte and Philippine National Police Chief Ronald ‘Bato’ Dela Rosa were among the higantes that paraded the streets during the festival. Visitors and devotees partake in the Dawn Penitential Procession at 4 in the morning, a day before the grand festival. Thousands of participants take a solemn walk along the major streets of Kalibo while praying the Holy Rosary on their way to the Cathedral of St. John the Baptist. On the last day of the festival, devotees and tourists gather to witness the transfer of the image of Santo Niño de Kalibo, which is followed by a pilgrim mass led by the town’s bishop and officiated by priests of Aklan. Of course, the experience won’t be complete without good food and buying souvenirs for loved ones at home. Check out the trade fair at the Kalibo Plaza Trade Hall where the they sell locally-made products from Kalibo. Meanwhile, food festivals can be found at the Pastrana Park and Magsaysay Park during the entire week of Ati-Atihan. First-time visitors should definitely try the traditional Binakoe – native chicken cooked in gata (coconut milk), and the Latik – cooked glutinous rice topped with a mixture of grated coconut and caramelised sugar. And to end the week-long festival, local and foreign tourists are encouraged to watch the Grand Finale called the ‘Pagpadungog’ (which means ‘to honour’), where all the winners of the street dance competition will showcase their amazing performances for the second time. This would also be your final chance to join the cheerful crowd and take part in tireless merrymaking. See the full list of events and schedule for the next Ati-Atihan here.